Food manufacturers must simplify the plastics they use and make them more amenable to recycling, the Local Government Association said on 4 August — describing the current prevalence of difficult-to-recycle plastics in many products as “almost criminal”. UK householders use around 525k tonnes of plastic pots, tubs and trays every year, but only 169k tonnes (about 32%) is capable of being recycled. Speaking to BBC News, LGA Deputy Chairman Peter Fleming highlighted the case of punnets of fruit and vegetables, many of which are made of up to three different types of plastic, including polystyrene, which can’t be recycled. The sheer number of polymers that can be combined in a single container also makes it uneconomical to sort and separate all this packaging for recycling. So it tends to be sent to landfill or incineration. 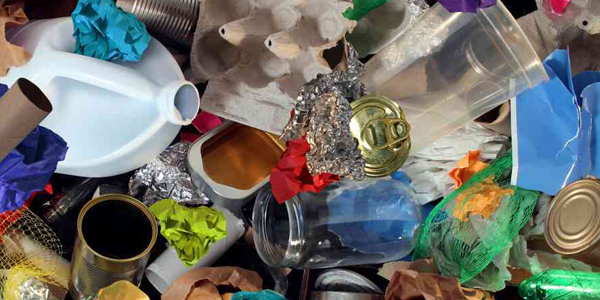 The LGA has suggested councils and manufacturers work together to prevent recycling-unfriendly materials from entering the system. In the absence of sufficient help from manufacturers, LGA environment spokesperson Judith Blake said “the government should step in to help councils”. Plastics manufacturers should also pay for the costs of collecting and disposing of plastics that can’t be recycled, said the LGA. Black plastic is a long standing bugbear of recyclers, since it isn’t picked up by the optical sorting equipment in common use at recycling facilities, although some recyclers and equipment manufacturers appear to have made advances (for example, this and this). This is an example of where simple tweaks could have a big impact, said the LGA, such as supplying items like microwaveable ready meals in a different colour of plastic. Black plastic is only used because it makes food look good. There are also developments being made to improve the recyclability of many plastics, as Adrian Griffiths, CEO of Recycling Technologies, said in response to the LGA’s comments. The firm said its own chemical recycling equipment enables the recycling of many materials currently sent to landfill and incineration, including films, coloured plastics, laminated plastics (i.e. crisp packets), black bin bags and multi-polymer pots, tubs and trays. This chemical recycling allows the aforementioned packaging items — which might be made from a range of polymers, including non-recyclable ones — to be turned into a valuable oil that chemical companies can use to make virgin-quality plastics, seemingly.